Has passed the Overnight FC loss test for 3 days now with no visible change. Shouldn't the water be sparkling at this point? It is still very cloudy. Is it my CH maybe? I have been scrubbing and vacuuming and the filter has been running 24/7. We were told that since we have a sand filter to only backwash when the psi reading goes up to 30-35. It is hovering at 29 at the moment. I'm afraid we have sand channeling so I'm hesitant to backwash. The last time we did, murky water came back from the returns. The filter is ancient and is probably older than me (and believe me I'm old). We have no idea when the last time the sand was changed or if it has ever been changed. What next? You can open up the sand filter and check for channelling, and deep clean the sand bed. Stick a garden hose into the sand and turn on the water. The sand should loosen up and all the dirt and gunk should float and overflow out of the filter. You might need to stir up the sand a bit. Keep this up until the water overflowing out of the filter is clean. If any sand is clumped together CAREFULLY break it up with your hands and be very careful not to damage the laterals. If the sand is very old you may want to go ahead and replace it with fresh filter sand. With a psi of 29, your filter sounds like it might be almost plugged, resulting in very little flow and very little filtering......Backwash it. Filter should be backwashed when the filter psi gets somewhere around 50% above normal. When you backwash and the water runs clear, stop the pump, turn the multiport to the "rinse" position, and run the pump again for another minute or so. Then, stop the pump, position multiport valve to filter and start back up. That should prevent dirt from getting back to the pool. While I think your issue is filtering, you should nevertheless lower your pH down to not higher than 7.4. With your CH above normal, a lower pH will help prevent cloudiness and scaling. How did you get a test result of CYA greater than 20ppm....did you mean less than 20? I just now saw zea3's post. Cleaning your sand is a very good idea. Backwash thoroughly first, rinse, then open it up and clean it as suggested by zea3. Again, thanks for your input. I'll look into what zea3 suggested and see if I can open the tank. And, I will try to conquer my fear of backwashing and do it tonight. The only thing is the filter is so old it doesn't have a rinse cycle. I will also add muriatic acid to lower the ph to 7.2 perhaps? Ooopsie, I meant to say less than 20 CYA. I should correct that. Can I ask a silly question? Is it safe to get in the water even though it's cloudy? I want to brush the side where I see some stain that I can't get out with a long handle brush. Or should I wait? If your FC is holding it is probably safe to get in the water. 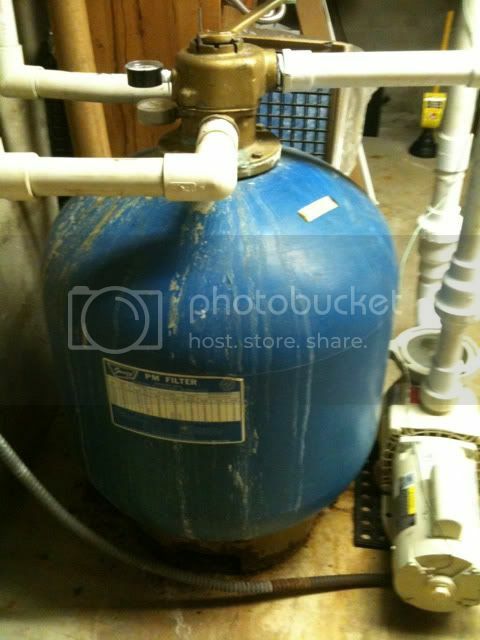 I wonder if you can add a new multiport valve and some plumbing to be able to rinse your filter? You may need to backwash longer to make sure all the gunk is out of the lines before switching back to filter since you can't rinse. Thank you. I figure it would be okay. I just won't let a kid get in there I suppose, a small body would disappear in the deep end. Another problem that I have is that the filter is inside the house. It's in the basement. I have to look into how I can open the tank and let water overflow without making a mess. I certainly have my work cut out for me. Floc is a lot of work, and doesn't always work. It is best to make sure the filter is working correctly and then let it do it's job. I think I would use flock as the last resort. Weeks ago when I was uninformed the pool store sold me a bottle of clarifier in liquid form, I asked what it is for and they said "exactly what it said in the bottle it will clarify the water" (that didn't work) then they sold me something in powder form called Sparkle, it's supposed to make the water sparkle (that didn't work either). This time, I want to fix the root of the problem. Thanks anyway. So I just backwashed and the psi is now down to 25. Since I don't have a rinse cycle, the dirty water came back in the pool . I wasn't sure at first so I put a sock in one of the returns and you wouldn't believe the cloud of white stuff that gathered around the return. Well at least now I know the source of my problem. The question is how to fix it. I think I will try to post a picture of the filter to get your advise on how to proceed. So here's a picture of my ancient filter. As you can see there are three PVC pipes attached to it. My husband said it's the kind that can't be unscrewed so in order to get to the sand he has to cut the PVC pipes to removed the head. The pipe on the other side is where the waste go. There is no window so we can't see when the water is clear. The multiport valve is also broken, he has to insert a nail in there to move the valve to backwash (no rinse). The filter is located in the basement of the house meaning it's much lower than the pool. So we have to somehow cut the water off first. Here's the kicker I can't put a hose in there and let it overflow without flooding the basement. I maybe way in over my head here. In the long run you need a working filter. There are some things you can do to get by for a time with things the way they are. But long term you are going to need to repair or replace the filter. Repairing it will be a bit of a project, but it isn't especially difficult if your are at all DIY inclined. You should install unions on the three pipes so that the top can be removed, get a replacement part for the broken handle, and check/clean/re-settle or replace the sand as needed. Do you have a means to drain the pool? If so, you would need to drain the pool below the level of the skimmer and plug the returns to prevent water from entering the pipes. If you have a main drain at the bottom of the pool you would need to find some way to block that as well. To empty as much water out of the pipes as possible, get some flexible tubing such as aquarium tubing long enough to reach from your pool to the filter and siphon out as much water as you can. Have lots of old towels and a few 5 gallon buckets available when you cut into the pipes to catch any remaining water. Adding valves and unions to your piping will make it easier to service the equipment in the future. You may want to consider saving up to move the pump and filter to a pad outside the house. You can get some estimates of what it would cost to re-plumb and move the existing equipment outside to see if it would be doable. Uhm... I think it's time to call the pros. Jason is right, in the long run we need a working filter. I decided to bring my FC back up to shock level last night. I was afraid my CC will go up with all that gunk that came back in the pool. Sure enough when I tested this morning, I lost 2 ppm and my CC is back to 1. Those tricksy little suckers. I guess I'm not done shocking. I think I will not backwash until the filter is fixed. Wow, this is a real learning experience. Thanks again for all the input. This forum has helped me tremendously.